London has so many fantastic attractions to visit and as part of my London Travel series, my aim is to give my readers as many reasons to visit London as possible. Recently I was invited to experience Dreamworks Tours; Shrek’s Adventure London, normally, I would have taken my 7-year-old nephew with me, as we have been before as part of a 3 attraction special deal I purchased which allowed us to visit Madame Tussauds, The London Aquarium and of course Shrek’s Adventure London, but as it was a school day and the summer holidays had just finished he couldn’t come, so I took my friend Denise from Fabulicious Travels instead as she wants to start blogging herself. We arrived at the Shrek’s Adventure 15 minutes before our set entry time which was at 1:00 pm, so that we could have plenty of time to get our tickets scanned and have our bags security checked. Luckily for us, there were only 10 people in our group including us which meant that we were able to move things along much quicker. As we walked through to the main area we were greeted by the Tour Guide, who set the adventure into play, whilst also running through the checklist of the do’s and don’t’s. 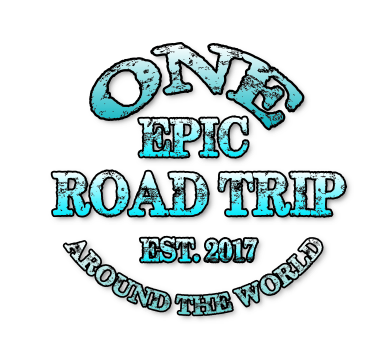 Which included enforcing that the use of flash photography, videography and mobile photography during the main tour is strictly prohibited. Which as a blogger and vlogger is a nightmare because I want to capture everything, but very understandable because if the whole event was captured, it would spoil the magic and no one would visit. This was essentially one of the best 4D experiences I have ever experienced because unlike a lot of other 3D/4D movies it’s not just in front of you, the whole experience is happening all around you, from all angles and you are apart of it, through the sights, sounds and sensations. Once the DreamWorks tour bus arrives in the Land of Far, Far Away you’ll have to work your way through various tasks including; mazes and game shows as well as interacting with various characters from the franchise both good and bad including Shrek, Donkey, Puss in Boots, Pinocchio, a few Princesses as well as witches and Rumplestiltskin just to name a few and audience participation is required, in order to move on to the next chapter of this interactive adventure. Without giving the plot away, I am proud to say that I volunteered myself to help the muffin man as my tour group were a little shy and hesitant to join in. Once the main adventure is finished, visitors have the opportunity to visit some of the other popular DreamWorks Animations movie themes and pose for photos with their own camera. The movie-themed areas included Madagascar 3: Europes Most Wanted, Kung Fu Panda and Trolls, I think that this changes every so often, because when I previously went with my nephew they had a How To Train Your Dragon theme instead of the Trolls theme. It’s probably due to a change again for 2019 when the How To Train Your Dragon; The Hidden World is released. 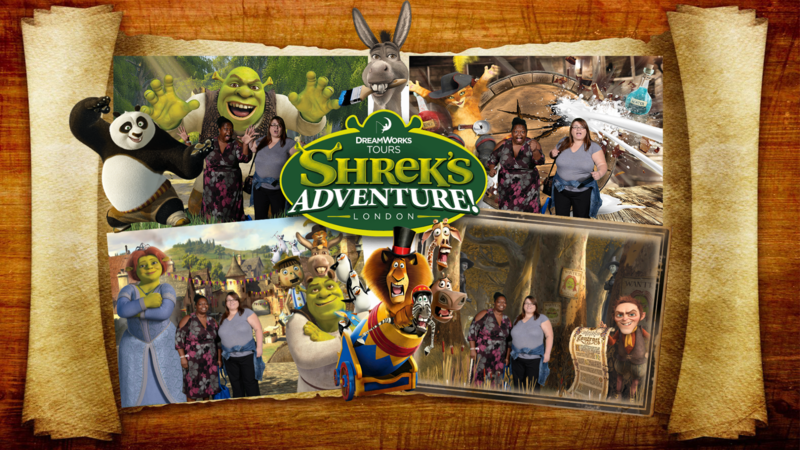 I have been to Shrek’s Adventure London, twice now and really enjoyed it on both occasions. It’s a fun experience for children aged 6 years+ because it’s a very interactive adventure and of course it’s enjoyable for big kids like myself as well. 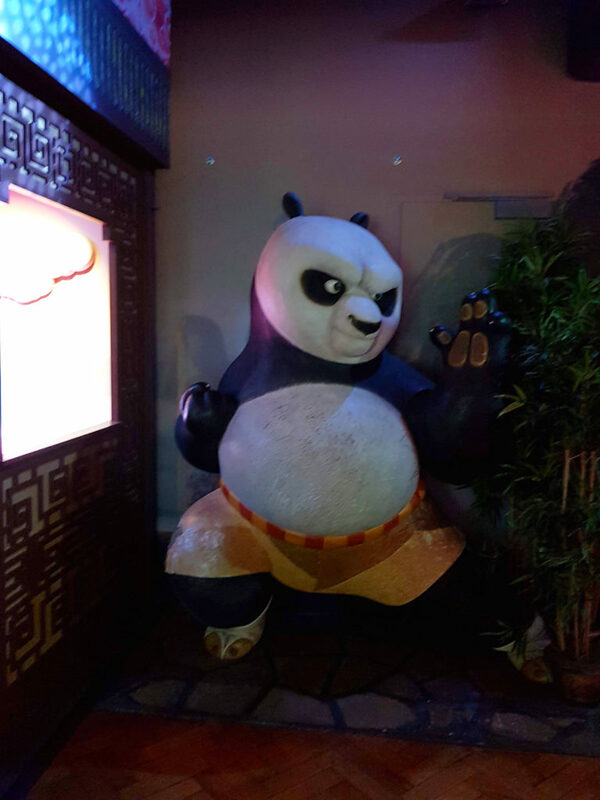 The only thing that I would say they could look at doing in the future is to have a few more characters like Kung Fu Panda walking around after the main story is finished in the other sections, to give the children a chance to meet and greet them and have photo’s taken with their own camera. The adventure does require some audience participation because effectively you are part of the story. The experience is what you make it, and if you’re not willing to cheer and join in when requested by the performers then you won’t enjoy it as much, because you’ll spoil the magic of the interactive adventure. (It’s ok to let your inner child out as no photo’s or videography is allowed during this section, no one will ever know). At the start of the adventure, you’re invited to pose for photos. The first is with a statue of Donkey, the second is in front of a green screen where you are asked to do a number of poses and they will add your images with a few Shrek theme backgrounds as well as a few other DreamWorks Animations characters. The third photo is with the man himself Shrek, which you can also use your own camera for. Should you choose to pay for this you get a photo book and the printed photos for £36, but if you want to save some money you can get the images emailed to you for £16 and print them off yourself which is what I did on this occasion as I had previously done the £36 option when I took my nephew the first time around. But this is not compulsory to do and there are opportunities to take photos after the main adventure. For those of you with children, it’s worth noting that there is no way to avoid the gift shop as you have to walk through it to exit the attraction. But it’s worth having a look around as they do have some special offers and reduced to clear items but you can get a look at how much the items cost are by looking at the online shop section on the attraction website. In the interest of making a day of your adventure, especially if you are visiting from outside of London. You might want to plan a few other activities to do during your trip to Shrek’s Adventure, as this is only around an hour long. So, I would recommend that you pick a morning time slot, leaving you to do some of the other sites and attractions that London has to offer (there are offers available on the ticket and offers section of Shrek’s Adventure website), you could also take a walk down the South Bank and see what events and activities are going on down there and if you have children with you and the weather is nice there is a park opposite the London Eye which is free to go to. Please Note: Times may vary for school holidays and special events, so check the website to check for the most up to dated times. I always recommend purchasing tickets online for most attractions as they tend to be cheaper and sometimes there may be a mix and match ticket deals available (So check the website for other offers). Please Note: Under 3’s get in for free and family tickets are available. 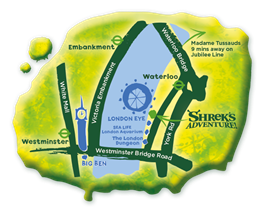 Shreks Adventure is Located on the South Bank next to attractions such as The London Eye, The London Aquarium and The London Dungeon. Opposite The Houses Of Parliment. What a fun time out! I am a big kid so I would have loved this. Great tips on booking a morning session which leaves you time to do something else for the rest of the day. Also great tip about the photos. Thanks for sharing. It’s a great place to visit with kids. My cousins are visiting UK this summer. I would highly recommend this to them as they have kids. The information on tube stations nearby to the place will surely be very helpful for them to commute. Who doesn’t love Shrek? 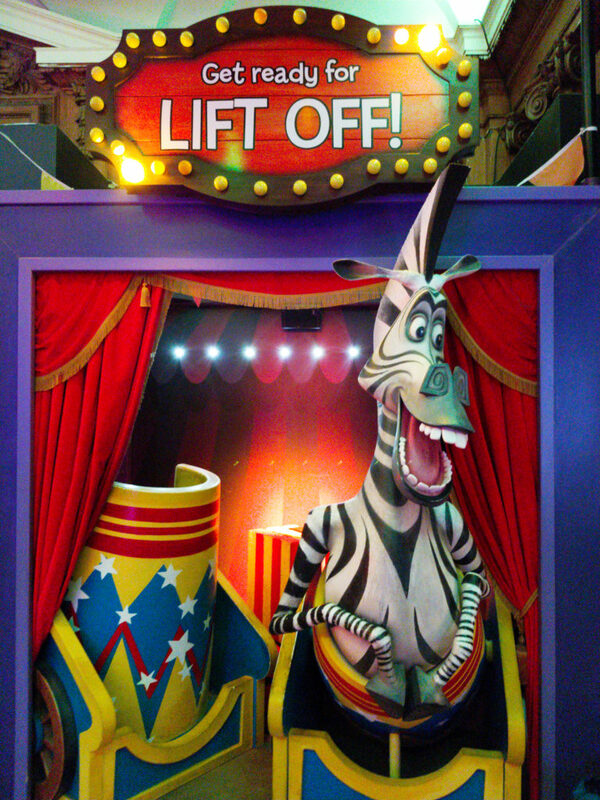 I’m a big kid who will have fun at Shrek’s Adventure. It’s good that you also give alternatives of transportation to get there, from tubes to buses and how long will it take you to walk from the tube stations. Very helpful. What a great place to visit with kids and with/for big kids :)! I would love to check it out when I visit London. Thank you for this interesting recommendation. OMG I love Shrek movie and this would complete the experience. Glad you and your friend enjoyed this trip! The fees are reasonable as well, and would be nice if there are coupon discounts! There is really so much to see and experience in London. 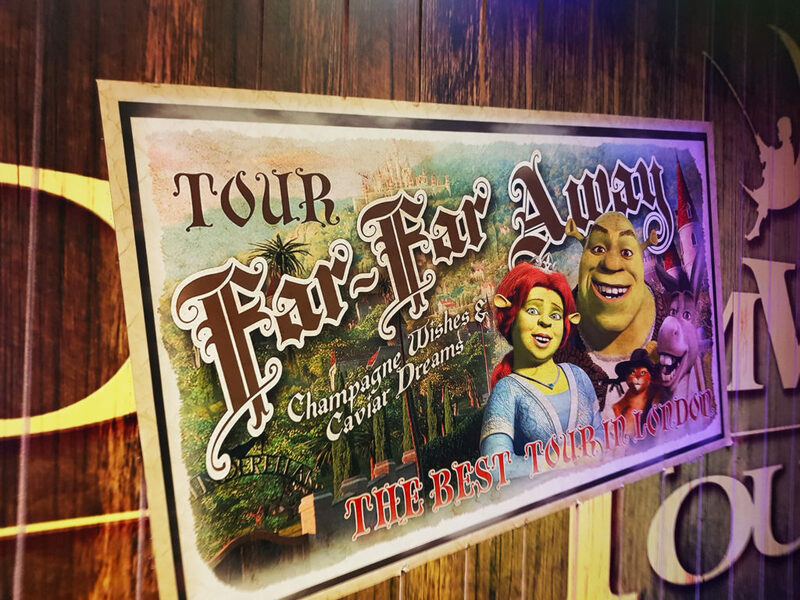 Shreks Adventure is another reason to visit the city. The Shreks Adventure experience sounds really thrilling though not being able to take videos is a dampener for us bloggers. The 4D experience is something that we would love to have. O wow…this is the first time, I am reading about this place. Looks like another reason to explore the city of London with kids. I am sure as you mentioned, the experience at such places depends upon the participation of the crowd and us. I am sure , my son is going to be fascinated by this place. I always feel that a place where there is engagement makes it really interesting. The audience participation always makes it a fun thing to do. So I am all for meeting puss in the far far away land. Thanks for the recco.